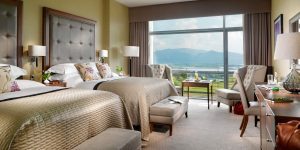 The awesome Aghadoe Heights Hotel & Spa is an ideal base for a Sightseeing, Family or Golf Tour in the South West! And what about those views?!? Alice & Tom visited Aghadoe recently and welcomed the opportunity to be reacquainted with one of Killarney’s most scenic hotels. A sumptuous selections of rooms including Lake Side Rooms, Garden Superiors, Garden Suites, Lake Suites, The Aghadoe Suite and The Penthouse. They have also recently refurbished some of their rooms, including their spacious and one-of-a-kind Aghadoe Suite. 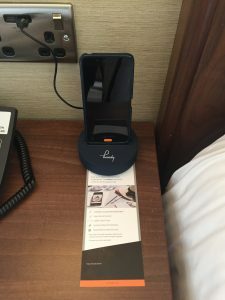 We were also very interested to see their handy travel units which allow residents to make unlimited local & international calls while also enjoying free internet access, latest travel finds, exclusive brand promotions and speed dial to hotel services. We think we might be seeing this a lot more in other hotels too! 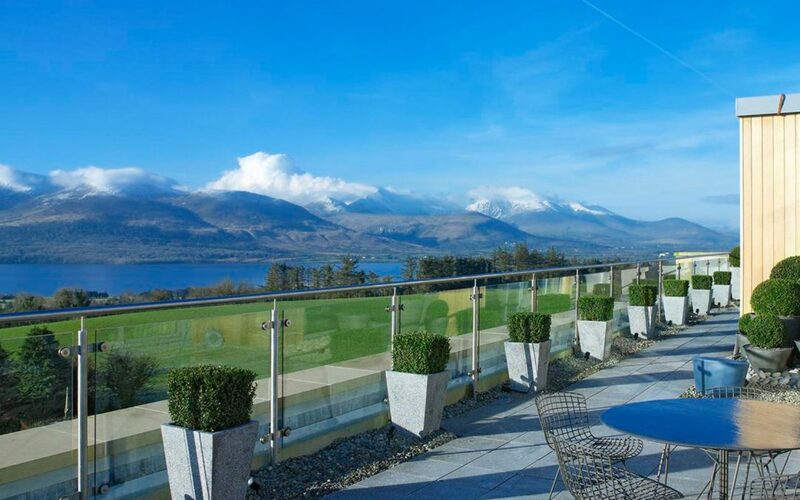 The Aghadoe Heights Hotel & Spa boasts every contemporary comfort from its elegant public areas to the wide decks and outside terraces that allow guests to fully embrace the majestic location that surrounds them. Even little things like USB ports for charging Smartphones or Tablets eliminates looking for that charger in the bottom of your bag or the one you forgot to pack, after all it’s the little things that makes life that little bit easier!! Dinner at Aghadoe Heights Hotel & Spa is leisurely and to be savoured; seasonal menus highlight the freshest Irish produce, prepared with innovation and care for the finest of dining experiences. For those wishing to have a more casual dining experience, The Heights Lounge and Piano Bar offers all day dining and tempting treats. The Terrace Bar, popular with visitors and guests alike, screens current sporting events and offers a casual, relaxed space to unwind. Surrounded by magnificent views, this is also ideal for private groups, parties, barbecues and special occasions. 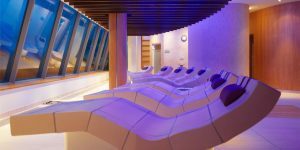 For those looking for that little bit of R&R then look no further to Aghadoe’s Spa! This hideaway in your already idyllic setting has has won numerous accolades, both in Ireland and internationally. The team of intuitive award-winning therapists can advise on the perfect way to de-stress and recharge mind and body – and after a day on the links or a day of sightseeing you may very well need it! The Spa at Aghadoe Heights has been designed to harness the power of this tranquility and draws inspiration from the breathtaking beauty that surrounds it. Using natural slate, cascading water and a palette of colours inspired by wild Irish flowers and grasses, The Spa at Aghadoe has created a refuge from everyday life, a space to rediscover yourself. So that was our recent trip to the awesome Aghadoe Heights Hotel & Spa! If you’re looking for 5-star luxury in amazing surroundings then look no further!! To add the Aghadoe Heights to your next Irish trip drop us a line and Experience Ireland with Us in 2019.